← American Values Club Orca crosswords free, limited time only! Filling in for Amy, who did Wednesday’s for me. I had an emergent dental procedure this afternoon so this will be brief. 1d [One going against the grain?] is a REAPER. This turns harvesting into an existential struggle, which I guess it pretty much is. 12d [Musical “girl who cain’t say no”] is ADO ANNIE. This was the gimme that helped that whole corner fall for me. 17a [First world capital, alphabetically] falls into the category of “fun facts to know and tell.” The answer is ABU DHABI, which was obvious as soon as I got a couple of letters, even though I didn’t realize until tonight that it’s the capital of the UAE. 38d [It could be on the tip of your tongue] is a TASTEBUD. If it is, you’re tasting salty/sweet. Tastebuds specialize and have a relatively standard distribution. 59a [Jacob’s partner in “A Christmas Carol”]. This would be Jacob Marley, who went into business with EBENEZER Scrooge. What I didn’t know before I did this puzzle: see above re: ABU DHABI. I had also never heard of NIGHTMARE FUEL. I leave you with Gloria Grahame as Ado Annie and a very young Shirley Jones as Laurie. First of all, I’m very curious as to how telemarketers pronounce our constructor’s last name when they call. It must be entertaining for Alex to hear them try. Though the theme of this puzzle was familiar, I still found it fun and chuckle-inducing at times. 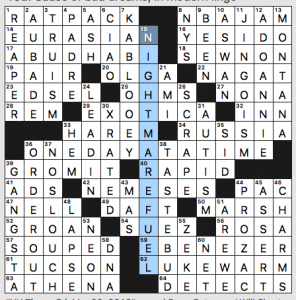 20-Across: [What Darwin did aboard the Beagle?] WRITE OF PASSAGE. Rite of passage. 25-Across: [London supermarket sections?] BRITISH AISLES. British Isles. 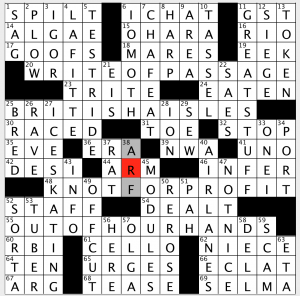 55-Across: [Lacking a critical watch-making supply?] OUT OF HOUR HANDS. Out of our hands. I had a lot of missteps in this puzzle starting with 1-Across, where I entered DIRTY instead of SPILT [In need of mopping]. This led me to DIP instead of SAG for 1-Down [Sink]. My less-than-stellar Spidey Senses eventually kicked in and told me that something was wrong, so I fled to the south. Some people stay to tough it out. Some flee. I’m in the latter group. Probably not my most admirable trait. However, I think that the theme answers were strongest in reverse order. The visual of a frustrated watch maker getting bent out of shape as he opens a drawer and finds he’s out of tiny little hour hands is pretty darn entertaining. The idea of someone earning a living by being a really good shoe-tier is hysterical (“The rabbit goes AROUND the tree THEN down the hole!”) British aisles? Sure! Why not? But I have to admit, I was totally ignorant of Darwin and his voyage on the Beagle. I’m never proud to admit ignorance, but I have to be honest. 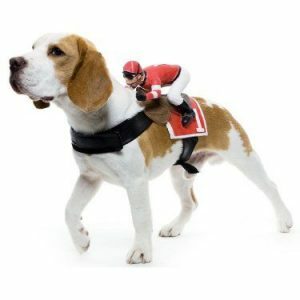 My first thought was that Darwin was riding a breed of dog, and I pictured the beagle I once owned totally confused as to why a man was trying to ride him like a horse. I mean, I couldn’t even housebreak that darned dog, let alone teach him dressage. So for the most part, the themers landed for me. GAH for PAH [“Blast it!”] Much prefer my wrong answer over the correct one. PAH feels dated to me. SORRY for SORTA [Wavering word] Don’t know what I was thinking there. TWA for NWA [Carrier merged with Delta since 2010] I’ve never seen NWA clued as anything unrelated to rap. I prefer that to stay rap-related. LUTE for HARP [Plucked instrument] But hey… there’s a lot of plucked instruments, right CELLO? Overall, smooth fill with some solid entries like GREAT STUFF and NOT NICE. Jim P. here sitting in for pannonica. Jim Q.’s post is elsewhere. Please, mind your Jim P. and Jim Q.
We’re treated this week to an over-sized grid featuring anagrams of a familial nature. Yes, only three theme entries, but those are nice finds, especially that matching pair of 16-letter grid-spanners. 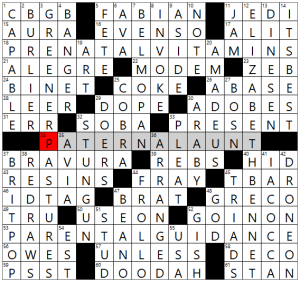 The grid may be 16×15, but it’s still only a 75-worder. It looks and feels wide open and yet it’s loaded with nice entries, not the least of which are the two crossing grid-spanners GREENER PASTURES and ELIZABETH BENNET (of Pride and Prejudice). Other favorites are AMADEUS, STUN GUN, BRIT POP, DOO DAH, DINESEN, BRAVURA (isn’t that a car? ), FABIAN, FROLLO, and IACOCCA. You younger pups probably don’t know that last one, but as the head of Chrysler back in the ’80s, he was kind of a big deal. Hey, guess what. He’s still alive and 93 now. I don’t think I’ve ever heard of BELMOPAN (7d, [Capital that replaced Belize City]). Per Wikipedia, after Hurricane Hattie destroyed 75% of homes in Belize City in 1961, a new capital was built on higher ground 50 miles to the west. The name is actually a portmanteau of “Belize” and “Mopan,” the names of two major rivers. I didn’t care so much for seeing CBGB, especially at 1a, but that was really it for crutchy fill. When your wide-open grid has only one iffy entry, you’ve got a good puzzle on your hands. Cluing felt tough, but then, this is the CHE, so it should be. It seemed like there were a lot of cutesy ? clues, but maybe that’s because I was struggling while trying to watch Ponyo with my daughter at the same time. 38d [Gerrymander, say]. REDRAWS. Don’t get me started. If there’s one single reason we’re in the mess we’re in, it’s this. I heard one of the Wisconsin districts that’s being redrawn originally looked like Bullwinkle the moose. There ought to be a simple way to define districts nationwide, and this practice of choosing your own constituents ought to be unconstitutional. 47d [Gas stopper]. BEANO. Ha! Didn’t know that this clue was going to go there, but it did. 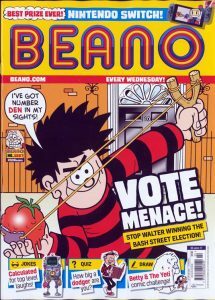 In the U.K., BEANO is a long-running children’s comic strip featuring their bastardized version of Dennis the Menace. No word on whether they use the strip to peddle anti-flatulence pills. 4d [Awesome song, slangily]. BANGER. I guess I’m old. To me, a BANGER goes with mash. 30d [Story about disillusionment in James Joyce’s “Dubliners”]. ARABY. I’m afraid I don’t know the story, but I do know the old song “Sheik of ARABY.” See below for Leon Redbone’s manic (more like maniacal) version. Overall, a beautiful puzzle, maybe light on theme, but elegantly constructed and filled with sparkly entries and juicy clues. This entry was posted in Daily Puzzles and tagged Alex Bajcz, Doug Peterson, Neville Fogarty, Neville L. Fogarty, Will Nediger. Bookmark the permalink. Seems a bit contradictory and I don’t expect many to agree with your assessment unless they knew most of the trivia. 4:28 for me, which puts it at roughly my average for a Friday NYT. Super easy for me. It was my second fastest NYT Friday ever and only a smidgen behind my fastest. I found it a bit harder than average. Didn’t know about 1/3 or so of the trivia and the cluing didn’t help for the rest. Then again, I was probably a bit out of it as I was able to fit “one step at a time” into less boxes than required for a while and didn’t realize until looking things over a few moments ago that the clue for RATPACK had “original” in it. No, no, no, no, no. 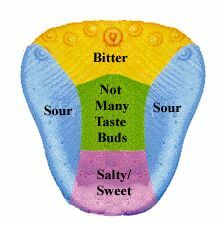 Taste buds most certainly do not work like that silly picture! All parts of the tongue taste all flavors. The variation is in the nerve that brings these sensations to the brain. In the front, we have the chorda tympani, a branch of the facial nerve, and in the back, we have the glossopharyngeal nerve. According to that picture above, damage to the chorda tympani or the facial nerve more proximally would result in loss of salty/sweet sensation. Many studies have been done, most notable those severing of the chorda tympani (or numbing with anesthesia,) and all have found that there is no impact on sensing certain tastes. Not that we really need scientists for this. Just touch a piece of food around different parts of your tongue. You will taste it anywhere. No more pseudoscience! Thanks for the post. This is an item in a lost file on my computer titled, cynically, Lies My Parents Told Me, but would more appropriately be Untruths that Baby Boomers Passed Unto Gen Xers or something. I’d say 65% of my rabbitholing starts from this site, but I don’t recall Myth (specifically, things many people believe that just aren’t true) being a topic here. For me it was a fascinating and cathartic google. If I’d the present wherewithal to sustain a rabbit hole I’m sure I could present a rather fascinating post, but, as it is, I’m left with only a few forthcoming items like: People only use 10% of their brain; Don’t swim after you’ve eaten until 30 minutes have passed; Crickets make that sound they make with their legs; Chewing gum stays in your system for 7 years if you swallow it; Your blood is blue when travelling away from the heart, or is it towards? The Great Wall of China can be seen from space, etc. Ultimately, among other outcomes, I was left having to reckon with the very difficult subject of Truth vs. Belief, and I hated it and loved it. And I now foster an existential appreciation of the work of skeptics and skepticism,… but, to digress, there were, pre-rabbitholing, a bunch of bits of knowledge in my brain that I believed, and that were false and whose veracity was very accessibly studied; e.g., the whole Humans Only Use 10% of Their Brain thing was part of maybe a thousand conversations I’d had–yeah, I’m still mad about that one. Sorry! I should know better. I blame the dental work. placematfan, you might like to check out a book called “Thinking in Bets”. Written by a poker player/cognitive psychologist Annie Duke. It talks about why we hold on to beliefs, as well as a way to think more probabilistically. Isn’t ABIDJAN the first capital city alphabetically? I memorized all the capitals in the world when I was in the sixth grade. I haven’t kept track. I am pretty sure that ABIDJAN was the capital of the Ivory Coast. Easy puzzle for me. I knew most of the trivia. I thought so too, but apparently Abidjan is the “economic capital” (per Wikipedia) of Ivory Coast and Yamossoukro is the political capital. I guess they wanted to cover both ends of the alphabet. Although Yaounde, Yaren, Yerevan, and Zagreb all come after Yamoussoukro. Steve, did you know that Nigeria changed its capital in 1991? Now second in the alphabetical list of capitals. It was Lagos when I memorized the capitals. I was in an accelerated class in fifth and sixth grade and one of my best friends and I got into competitive world geography. The teacher had a blank map of the world and we competed every week spelling bee style. He was better than I was, but I remember my greatest victory: identifying NOVAYA ZEMLYA (sp?). Today’s spelling bee and geography bee participants are infinitely better than we were. A rail is also a type of bird that inhabits marshlands. I’ve seen ADO ANNIE but I don’t know how it’s pronounced. If you say the first word like in “Much Ado about Nothing,” it sounds strange, but if you say it to rhyme with Play-doh, it also sounds strange. Speaking of Ada, the Times has a series of delayed “obituaries” of important women overlooked because of their gender. One is that of Ada Lovelace, who invented the computer program. It includes a link to the Babbage paper in which her “Notes” lay out the principles. One note, for example, describes “cycles,” or loops. I found it fascinating. Martin, I recently read “Enchantress of Numbers: A Novel of Ada Lovelace” by Jennifer Chiaverini and loved it. Fascinating history I knew so little of prior to the book. Those belated obits were kind of fascinating, among them one noting that Charlotte Brontë did not get an obituary in the Times when she died, but years later her husband, apparently famous only for being the husband of Charlotte Brontë, did. CHE: I didn’t know CBGB, BANGER, or ALEGRE, so that corner was a toughie. I like the theme, though. Lovely anagrams. Thanks to Gareth, who sent me a link to a world capitals quiz a while back, I got ABU DHABI right away. Thanks, Gareth! NYT: Stumbled on a number of trivia, but I liked a few things quite a bit. One is the use of Helicase to clue DNA. The other is the sleep mini theme, with NIGHTMARE FUEL, REM and RAPID. I know the scientist who first described and coined REM for rapid eye movement, Dr. Bill Dement, from Stanford. He’s almost 90 now. He defined the architecture of sleep and described sleep disturbances as true disorders. I was a postdoc in a lab down the hall from his and volunteered myself and my newborn son for early studies of sleep architecture in infants that the Dement group was conducting at the time. Somewhere we have a tiny blue t-shirt with EEG tracings all over it and the lettering “Ask me about my REM”. Thanks Tracy! An addendum to the story is that the same infant who earned that T-shirt is now a neuroscientist/psychiatrist who studies the brain control of sleep. CHE: I liked the Chronicle puzzle’s title but was a bit less enthusiastic about the puzzle than I usually am. I especially didn’t appreciate CBGB, which I’d never heard of, crossing slang I didn’t know (BANGER, which is in my slang repertoire, but with a very different meaning). Having _ANGER leaves far too many possibilities. I also had to Google for BELMOPAN, since DOPE as a slang word for Terrific was also unknown to me. So yes, I’m old enough to know IACOCCA but too old, apparently, for the slang. I’m always happy about Gilmore Girls trivia, so I liked starting off with CBGB. In the NYT puzzle, can someone explain both 4D (“Padre”) and 41A (Ads) to me! A circular for a grocery store has ads within. Piccadillo on the LA Times puzzle: lt is gmt not gst. Google Greenwich Standard Time and it directs to Greenwich Meam Time.